Although winter in Las Vegas is relatively mild in comparison to other parts of the country, cooler temperatures and winter storms make home maintenance a necessity. Prevent damage to your home, surrounding property and outdoor accessories by performing the tasks on our winter home maintenance checklist. 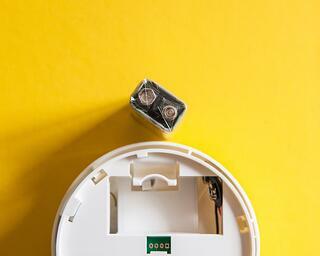 Test the batteries in your smoke detectors and carbon monoxide detectors and replace as needed. Check the expiration date on fire extinguishers around your home, as well as the level of charge to ensure all equipment is functional in the event of an emergency. Radon testing during cooler weather can help detect harmful levels, as windows and doors are more likely to remain closed, trapping this natural gas. A radon level of four or higher is considered unacceptable by the EPA, and requires immediate attention from a qualified professional. Winterize your cooling system and ensure your heating system is in peak condition to maximize equipment efficiency and longevity. An HVAC system that is regularly tuned, cleaned and maintained uses less energy to heat and cool your home and requires fewer major repairs. Check around doors and windows for areas of leakage, using caulking or weather stripping to seal leaks as needed. This will also make your home more energy-efficient and may lead to a lower power bill. Heavy winds and rain can cause flooding, making it imperative your gutters and downspouts are in working order to channel the water away from your home. Whether you do it yourself or hire a professional, it's important to perform an annual roof inspection to check for any missing or damaged shingles and to ensure the flashing around chimneys, skylights and pipes is sound. Protect window screens and shades with regular maintenance and cleaning. Remove screens in the fall and spray them lightly with a mixture of vinegar and water, rinsing with a gentle spray from the hose. Allow them to dry thoroughly before replacing or storing them. Gently hose off exterior windows and shades, using a soft-bristled brush to remove stubborn dirt or debris as needed, in accordance with the manufacturer's instructions and guidelines. Winter home maintenance is important to the safety and comfort of your home and family. By taking the steps detailed above, you can help prevent costly repairs to both the interior and exterior of your home, save money on the cost of energy and increase the value of your property. For expert advice and installation of interior and exterior window shades, retractable screen doors, or retractable awnings, contact Polar Shades today at 877-260-6110.